HUNT, Texas – The narrow road, lush greenery and low gray skies reminded Michelle Rechka of home. She traced a sharp curve of Farm Road 1340 through a dip where it crosses the Guadalupe River and followed the road up the river bank to reveal a broad pasture marked with a strange but for her, familiar-looking, sight: A collection of huge concrete rectangles standing on end, topped with horizontal pieces of concrete and all arranged in a circle. “For a split second, I thought I was driving in England,” Rechka, 47, an Oxford, England, native now living in Port Jefferson, N.Y., said after getting her first look at the Texas version of Stonehenge. The quirky roadside attraction, known as Stonehenge II, mimics the mysterious prehistoric circle of stone monuments about 100 miles southeast of London. 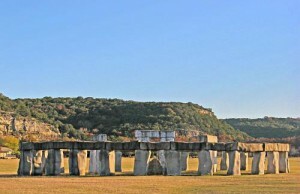 Like its English counterpart, Stonehenge II, in the Texas Hill Country about a 90-minute drive northwest of San Antonio, draws curious visitors from around the world. Unlike the more famous version, the Texas attraction, erected a generation ago under the guidance of a whimsical landowner, is headed for a new home. Al Shepperd, a Dallas hotel owner who retired to the Hill Country, commissioned the work in 1989 and died five years later. Now his heirs want to sell the nearly 22-acre riverfront property, but worried what potential buyers would think of the landmark. 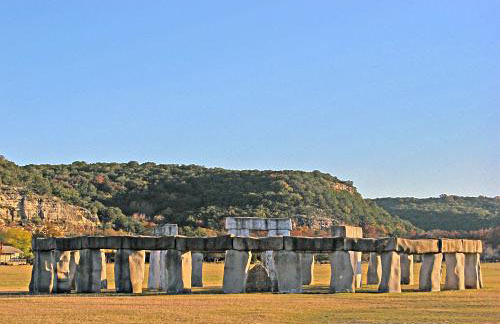 “We just feel like no one would want to buy it if they had to take the Stonehenge,” said Al Shepperd II, a San Antonio lawyer whose family inherited the land from their eccentric uncle. While acknowledging it’s a great free attraction for tourists, Shepperd said the site also requires maintenance. He cuts the grass every couple of weeks and picks up litter. The Hill Country Arts Foundation, where the elder Shepperd served on the board of directors, has accepted Shepperd’s donation of Stonehenge, plus a couple of replica Easter Island heads, and is raising $50,000 for a construction company to move the items to its campus a few miles to the east in Ingham, hopefully by the end of summer. “We’re happy to have it here,” said foundation executive director David Cockerell. “He was definitely a character, delightful,” Cockerell said of Shepperd. “My board of directors took a deep breath and said we’d raise the funds. We’ve had a lot of interest and there’s a lot of people that want to keep it here in the county. The replica Polynesian statues were moved in mid-July. Now, visitors have only a few more weeks to see Stonehenge II the way Shepperd intended before it’s dismantled and relocated. Hill started Shepperd’s creative juices in 1989 with the gift of a chunk of limestone deposited in the middle of the hay field a couple hundred yards from Shepperd’s home just off the Guadalupe River. The limestone was left over from a patio project. Shepperd stood it on end, wanted attention paid to it and suggested building an arch to make it more visible. The arch reminded him of Stonehenge and he went with the theme, insisting however that what would become Stonehenge II be no taller than 13 feet, or about two-thirds the size of the English landmark. Hill, 58, an insurance agent in nearby Kerrville, remembers seeing up to 200 people at a time converging on the site, tourist buses emptying passengers and school buses delivering children who played hide-and-seek around the 30 broad pillars he and a couple of associates fashioned from steel reinforced bars they shaped into irregular skeletal rectangles, then coated with the contents of more than 800 bags of concrete. Rain or shine. Summer or winter. Someone always is taking a look. “Pretty cool,” Julie Farris, of Rockwall, a Dallas suburb, said as she checked it out with her family. There’s been at least one wedding here. A three-piece Mexican band showed up one day, set up their instruments and shot an album cover. A man wearing formal white tails on horseback visited. So did a troupe of ballerinas, a group dressed in Shakespearean period garb and folks who carried in an old couch to use in a family photo. Then there were the “campers who wouldn’t go” and had to be prodded to leave so others could enjoy the site and the “Renaissance guys who like to beat each other with their plastic swords,” Hill said. After Shepperd’s funeral in 1994, some of his ashes were scattered around the site. For Michelle Rechka, who’s visited the ancient Stonehenge, the Texas version was a worthwhile detour as she, her mother and her two boys continued a cross-country U.S. trip. “I’m glad I did,” she said of the stop, adding that unlike Stonehenge in England, no fence or barrier kept them from exploring and wandering inside the circle of standing stones.